As an organisation of over 8,000 people, the coming together of Vodafone and Ziggo to create VodafoneZiggo in January 2017 brought change that affected many employees and had the potential to impact customer experience. The newly formed company was aware of how important it was to track employee sentiment throughout the merger and beyond. VodafoneZiggo adopted Peachy Mondays‘ technology to stay connected to people across the business. Both Vodafone and Ziggo had historically used surveys to engage with employees, but the formation of VodafoneZiggo presented an opportunity to use newer, better methods of collecting feedback. To ensure shared ownership across the organisation, it was important that the chosen platform was flexible enough to break down information into specific business units and stages in the employee lifecycle, all while maintaining anonymity. VodafoneZiggo define an engaged employee as being ‘dedicated to their work, absorbed in their daily job and energised by their work and organisation’. It was important that their partner was flexible enough to be able to measure their specific definition of engagement as well as offering a wide range of measures to provide a true reading of how people are. Furthermore, VodafoneZiggo wanted the ability to identify any issues early, to drive solutions and evaluate progress across the business as the company developed. This would require more than a simple survey, as it was to form the basis of wider conversations between managers and employees. But to get maximum participation from a workforce who were adjusting to change, VodafoneZiggo put the user experience at the centre of the solution they sought out. It was important for them that the employee feedback system was easy for employees to engage with and accessible on all devices. In their search for an employee engagement and feedback platform, VodafoneZiggo sought out an innovative partner driven by technology, flexibility, and data. They found Peachy Mondays was an ideal match. So what have been the results? From initial meeting to full roll-out, Peachy Mondays was set up and implemented within a matter of weeks. VodafoneZiggo has been primarily using Peachy Mondays to conduct short and frequent engagement surveys with employees – the ‘Heartbeat’ – circulating them around three times a year to give departments and managers time to work on employee engagement between updates. Access to the platform has been configured to allow HR, HR business partners and managers across the organisation to view and manage their results. Results are available immediately after each poll, allowing VodafoneZiggo to share the outcomes with employees and take action quickly. The platform’s innovative Targeted Anonymous DialogueTM feature has enabled VodafoneZiggo to dive deeper into their results. Anonymous follow-up conversations with employees have enabled VodafoneZiggo to understand and take action on employee feedback. As an example, follow-up conversations to understand Net Promoter Scores (NPS) identified a need to improve awareness of products and services across the newly formed organisation. NPS has increased significantly as a direct result of post-survey communications and activity. Peachy Mondays and the ‘Heartbeat’ are central to our employee feedback and performance culture. We’re more agile, more people-centric, and can understand and take action on employee sentiment at all stages of the employee lifecycle, increasing levels of engagement and ultimately improving the employee and customer experience. Despite organisational restructuring, every index has improved since the survey began. Employees from both organisations had participated in feedback surveys previously, however employee response rates were typically low. After a few cycles of the new VodafoneZiggo survey, employee participation has increased to over 80%. Peachy Mondays enables us to measure how our employees are doing so we can see how their engagement is, how their energy is and how dedicated our employees are to their work and we can take action upon that to make sure all employees are as happy as possible. It is a tool for managers to have continuous dialogue with their teams. It feels like real-time insights into how people are doing. As their confidence in the platform has grown, VodafoneZiggo have made results available to all of their line managers. Managers can see the results for their team in a dashboard which also highlights progress over time, strengths to build on and opportunities to improve. Employee views of management are now embedded in performance measurement, holding managers directly accountable for their employees’ experience of work. 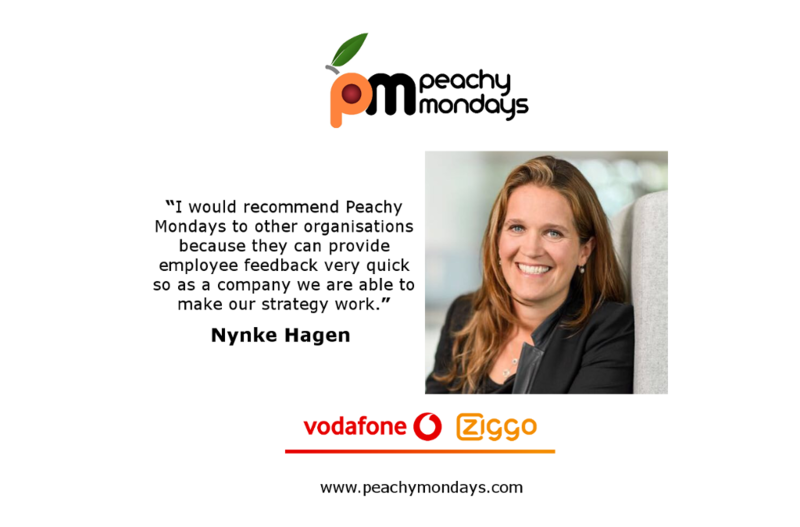 VodafoneZiggo have committed to a long-term partnership with Peachy Mondays. Together they will continue to work to understand and take action on employee sentiment, increasing levels of engagement and ultimately improving customer experience.